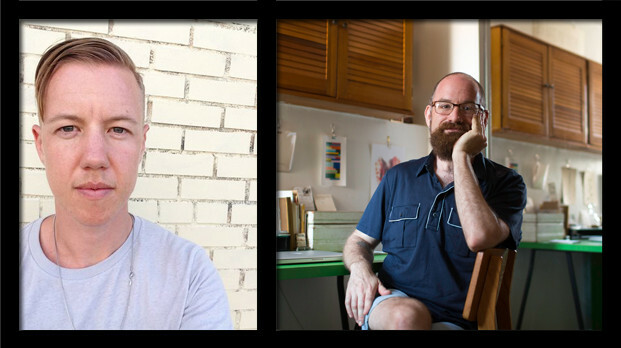 Brian Teare, who conducted two interviews in the Wexler Studio in spring 2015 (Rachel Zolf, PennSound podcast #48, and Brent Armendinger, PennSound podcast #51), is an assistant professor of English at Temple University and the author of five books of poetry, including The Empty Form Goes All the Way to Heaven and Companion Grasses, as well as a number of chapbooks. He also makes books by hand in Philadelphia for his micropress, Albion Books. Jaime Shearn Coan lives in Brooklyn, New York. His writings on dance and performance can be found regularly in The Brooklyn Rail. Jaime has been in residence at Poets House, VCCA, Mt. Tremper Arts, and the Saltonstall Foundation, and is the recipient of a Jerome Foundation Travel and Study Grant. A PhD student in English at the Graduate Center, CUNY, Jaime teaches at Hunter College and serves as the 2015–2016 Curatorial Fellow at Danspace Project. His poetry chapbook, Turn It Over, was published by Argos Books in 2015. A transcription of this conversation can be found here.